Having thoroughly covered the basics of the “built” packages I’m now ready to up the ante by showing them in action. I wrote this code in a day and a half to use as an example in my talk at the Dart summit (video). It was designed to show off built_value and source_gen, but it also shows something about Dart: that you can do a lot with just the SDK and the core packages from dart-lang. The built_value chat example in action. # Run these three in separate terminal windows. Welcome to the built_value chat example. For help, type /help. You are connected as anon9531. It’s not particularly beautiful — but if you connect in a few more tabs, you’ll find it’s a fully functional chat application. It has login, away/status messages, and public and private messages. If you change the code you’ll find that client changes are picked up immediately on refresh. For server changes, kill then relaunch “dart bin/main.dart”. Let’s take this piece by piece. // Try sending requests to pub serve. // If that didn't work, must be a problem with pub serve. We’ll tweak this a bit later on to add message handling. And that’s it. No need for any kind of framework. Obviously, the UI is very minimal — if I wanted to do more I’d switch to Angular. Chat applications need to be able to send messages from the server to the client, so simple POSTs aren’t enough. I opted to use WebSockets, which provide persistent two-way communication channels. Where “socketReceiver” is a function that accepts the newly created WebSocketChannels. “webSocketHandler” will reject plain HTTP requests, so those will continue down the cascade. Of course we need a wire format; since I wrote this code to show off built_value I’m of course using its serialization. Just plain JSON with hand-written conversion would be straightforward — but the whole point of built_value is that you get that for free. One side note: currently, the example uses non-encrypted connections. Unfortunately non-encrypted web socket connections can sometimes be blocked by badly-behaved proxies. The way to fix this is to switch to encrypting your entire site, i.e. making it “https” instead of “http”. This is a pain to do, but it’s arguably a good idea for other reasons. The server login, client logic and client rendering are all built around these object model classes. When you type something the client code needs to match and handle possible commands. This is a simple matter of string matching followed by building and sending object model classes as appropriate. Full code. Incidentally, this pattern of encapsulating simple rendering logic inside data classes also works well for internationalization. 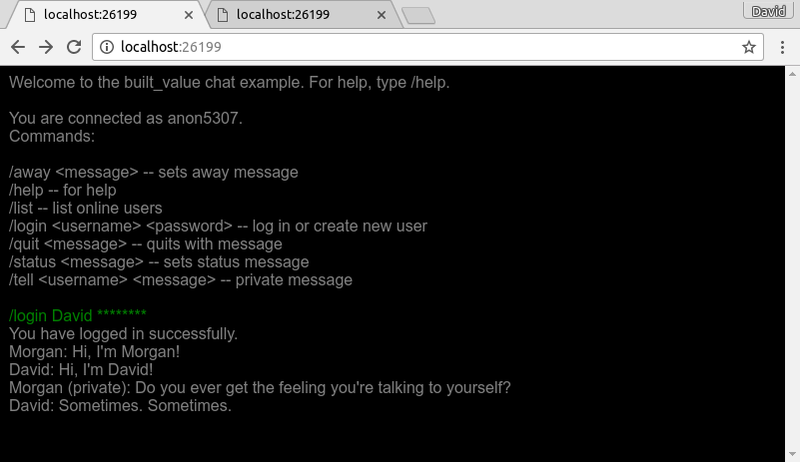 In the server we keep the state: the chat log, usernames and passwords, and user statuses. When a message is received, we update the state and send out messages as needed. Full code. For example, here “command” is a message received from a client. If it’s a “chat” message, we check whether it’s intended to be private — if it specifies targets — and either send it to everyone or to just the targets, as appropriate. And there we have it — a chat server and client in 820 lines of code. For those keeping count, an additional 1120 lines is generated by built_value, and end to end testing took 155 lines. Wait — end to end testing? I said it took a day and a half to write; half-way through I got annoyed that every time I added a feature I had to manually test to make sure I hadn’t broken anything else. So I took a step back, refactored for testability, and added test coverage for the major features. Next week I’ll walk through exactly how the chat example is tested, and just how great it is to test with Dart on both the server and client. Software Engineer at Google; works on Dart. Dart is a modern, type-safe programming language from Google, focused on enabling fast development and great user experiences for mobile and web applications. Learn more at https://dartlang.org.